Search across all ProQuest platform databases with the Basic Search. 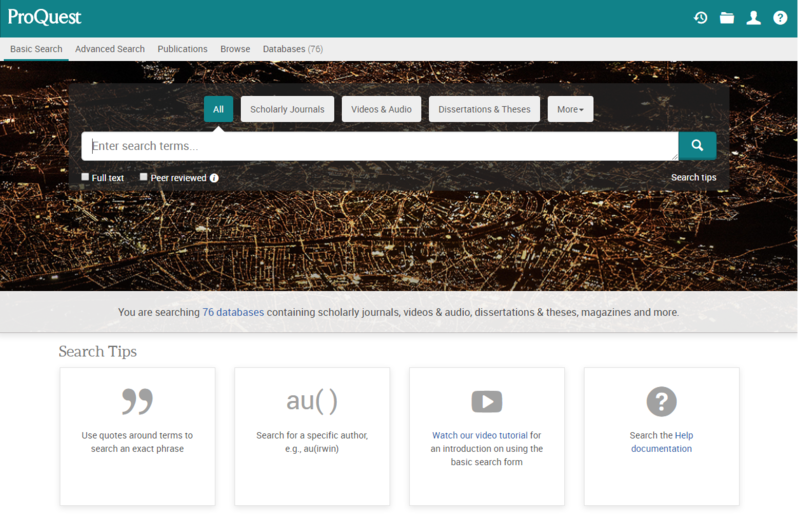 You can search All source types or choose to limit your search by a source type such as Scholarly Journals, Videos & Audio, Dissertations & Theses, Books and others that are available through the More menu. Additionally, you can limit your search to items containing Full text from ProQuest and Peer Reviewed items to only find documents reviewed by subject matter experts. If you are only searching a single database directly, you will not see not see the source type selections. Search Tips are available below the search box and at the bottom of the Basic Search page. Visit the Search Tips and Basic Search Help Documentation for detailed help on working with operators, fields, special characters, operator precedence, stop words, and other platform search tips. You can also visit the ProQuest Platform Search Tips section of this guide to review platform search defaults and tips. If you want to change your database selection, click on the Databases link at the top of the platform or the databases link under the Basic Search box. This page lists out all the databases that your organization has access to through the ProQuest platform. You can choose multiple databases to cross-search too. If you want to create a more structured query, searching across different fields, more details on how to do this can be found on the Advanced Search page within this guide. Click the Next: Advanced Search button at the bottom-right of this page to be taken to the Advanced Search Tips or select the Advanced Search option under the ProQuest Platform Search Tips menu.